Analytic solutions of radially symmetric nonlinear Schr¨odinger equations with two nonlinear terms with different powers are analyzed for 1D, 2D, and 3D spaces. They are typical of the equations, where there are two nonlinear terms instead of one cubic term, as a rule. An important feature of the solutions obtained is that they are expressed not in terms of hyperbolic functions, but in terms of rational functions finite in the entire space with a power asymptotics at infinity. The solutions obtained significantly expand the range of applications of the nonlinear Schr¨odinger equations. Separate relevant cases of the general solution are considered in the applications. S. Dutta, E.J. Mueller. Collective modes of a soliton train in a Fermi superfluid. Phys. Rev. Let. 118, 260402 (2017). N. Taghizadeh, Q. Zhou, M. Ekici, M. Mirzazadeh. Soliton solutions for Davydov solitons in a-helix proteins. Superlattices and Microstructures 102, 323 (2017). L.S. Brizhik, A.A. Eremko, B. Piette, W.J. Zakrzewski. Static solutions of a D-dimensional modified nonlinear Schr¨odinger equation. Nonlinearity 16, 1481 (2003). L.S. Brizhik, A.A. Eremko, B. Piette, W.J. Zakrzewski. Spontaneous localization of electrons in lattices with non-local interactions. Phys. Rev. B 68, 104301 (2003). L.S. Brizhik, A.A. Eremko, B. Piette, W.J. Zakrzewski. Spontaneous localization of electrons in two-dimensional lattices within the adiabatic approximation. J. Math. Phys. 44, 3689 (2003). E.A. Kuznetsov, V.E. Zakharov. Nonlinear coherent phenomena in continuous media. In: Nonlinear Science at the Dawn of the 21st Century. Edited by P.L. Christiansen, M.P. Sorensen, A.C. Scott (Springer, 2000), Chap. 1 [ISBN: 3-540-66918-3]. Yu. Rapoport, V. Grimalsky, A. V. Lavrinenko, A. Boardman. Double resonant excitation of the second harmonic of terahertz raditation in dielectric-graphene layered meta-materials. J. Optics 19, 095104 (2017). A.D. Suprun, L.V. Shmeleva. The centrally-symmetric solutions of electronic excitations of semiconductors in the conditions of relativistic like degeneracy of dynamical properties. Funct. Mater. 21, 69 (2014). T.A. Davydova, A.I. Fishchuk. Upper hybrid nonlinear wave structures. Ukr. Fiz. Zh. 40, 487 (1995). S. Hussain, S. Mahmood. Magnetosonic hump and dip solitons in a quantum plasma with Bohm potential effect. Phys. Plasmas 24, 032122 (2017). R.Y. Chiao, E. Garmire, C.H. Townes. Self-trapping of optical beams. Phys. Rev. Let. 13, 479 (1964). A.C. Scott. 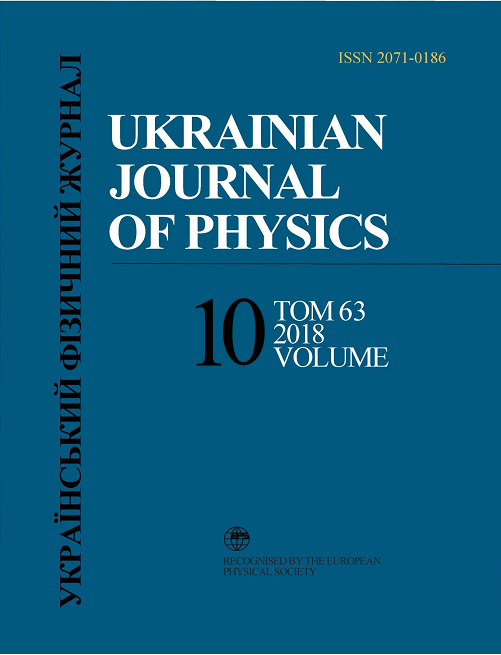 Dynamics of Davydov solitons. Phys. Rev. A 26, 578 (1982). C.B. Muratov, V.V. Slastikov. Domain structure of ultrathin ferromagnetic elements in the presence of Dzyaloshinskii–Moriya interaction. Proc. Math. Phys. Eng. Sci. 473, 20160666 (2017). L.S. Brizhik. Electron correlations in molecular chains. In: Correlations in Condensed Matter under Extreme Conditions. Edited by G.G.N. Angilella, A. La Magna (Springer, 2017), Chap. 15, p. 215. A.D. Suprun. Self-accelerating Painleve-II soliton: A curious mathematical trick or fundamental physics? Funct. Mater. 9, 389 (2002). A.D. Suprun. Two types of soliton solution of Schr¨odinger equation with the total nonlinearity of 5th degree. Funct. Mater. 8, 436 (2001).